Ditch the bread for your next sandwich wrap and use nutrient-packed collard greens! 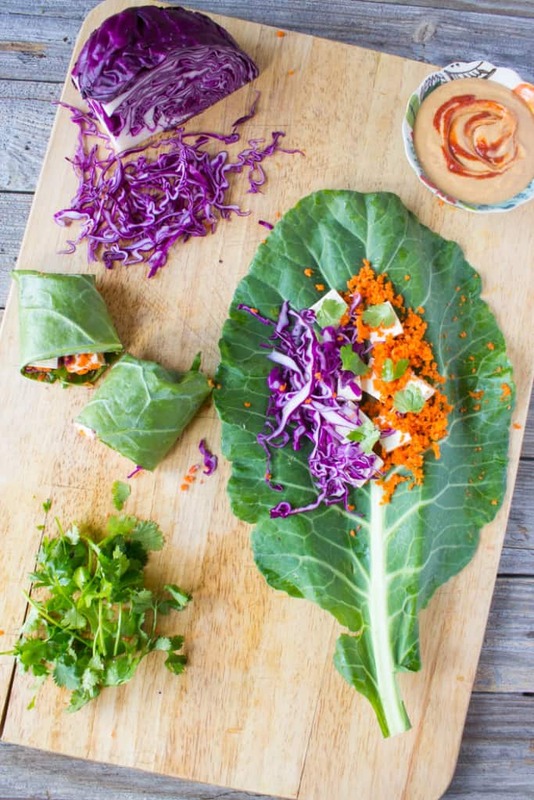 Start with these collard green wraps with tofu and thai peanut sauce. 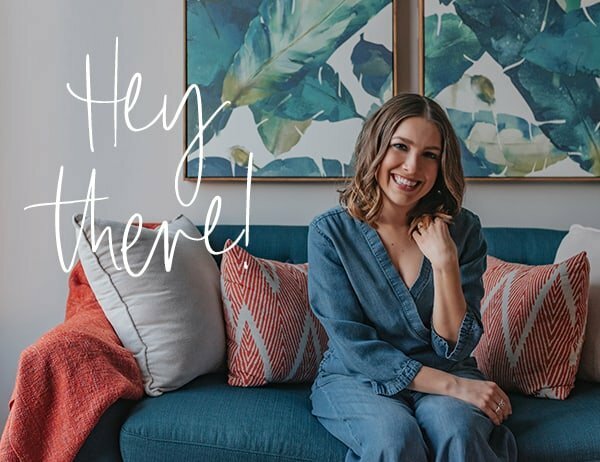 Often times people ask me where do you get your inspiration for recipes for your blog? The answer, in short, is EVERYWHERE. 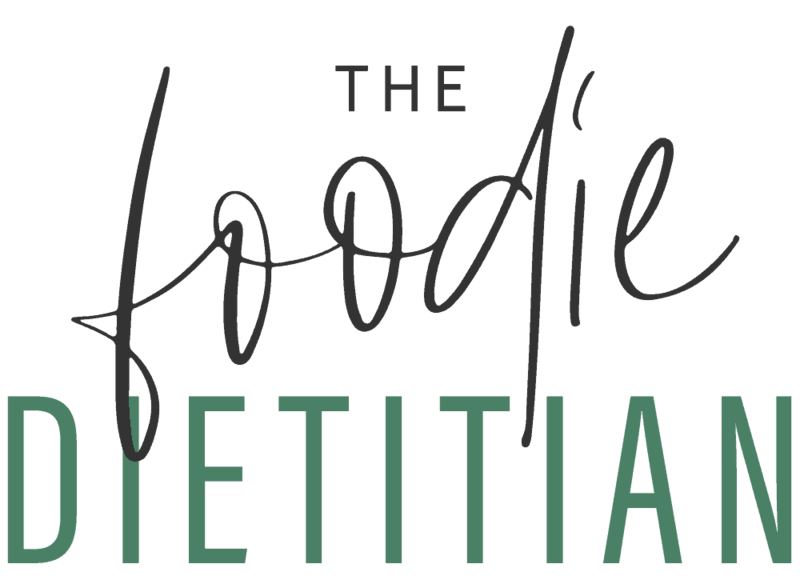 Pinterest, restaurants, food trends, ethnic cuisine, the seasons, blogs, and the list goes on. Usually, it’s the seasons that guide my recipe development – finding new, creative ways to use the produce that’s abundant during that time of the year. 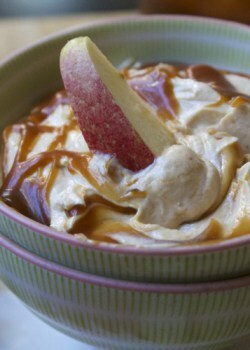 But lately, it’s the new “it” food trends that are inspiring me to see what all the hype is about. Last week, it was matcha green tea powder. And this week, it’s collard green wraps. Now trust me, collard greens are nothing new. This leafy green vegetable (a member of the cabbage family) has been around forever. Nutrient-packed, these greens are an excellent source of vitamin A, C, and folate and a good source of calcium and fiber. Plus, its thick leaves make it sturdy enough to roll into a wrap without tearing. You can add any ingredients to a collard green wrap – anything you would normally throw in a wheat wrap or on a sammy, pile it onto the green. 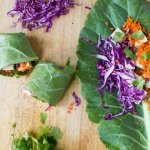 The ultimate collard green wrap combo = protein + more veggies + grain (brown rice, quinoa, millet, etc.) + sauce. I skipped the grains this time because I wanted it to be a raw/no cook meal but I could definitely use some grains next time to make it a more filling meal. 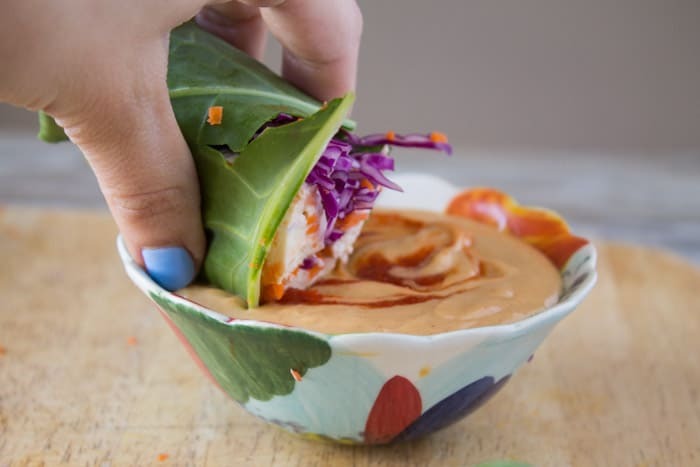 Now let’s talk about this peanut sauce. Oh. Mah. Gawd. It is finger-licking good. I had my friend Elizabeth from Don’t White Sugar Coat It try it as she spent a long weekend staying with us and she gave it her seal of approval. It’s nutty, sweet, and spicy and I want to put it on ALL THE THINGS now. 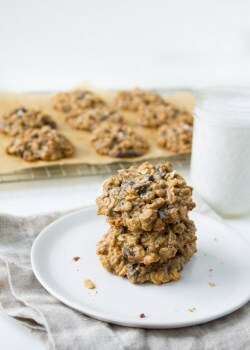 Plus, the peanut butter and coconut milk adds a nice healthy fat component along with a little extra protein! 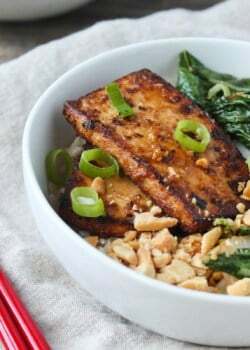 In a bowl, whisk together peanut butter, honey, coconut milk, lime juice, soy sauce, and curry paste until smooth and combined. Add sriracha to taste. 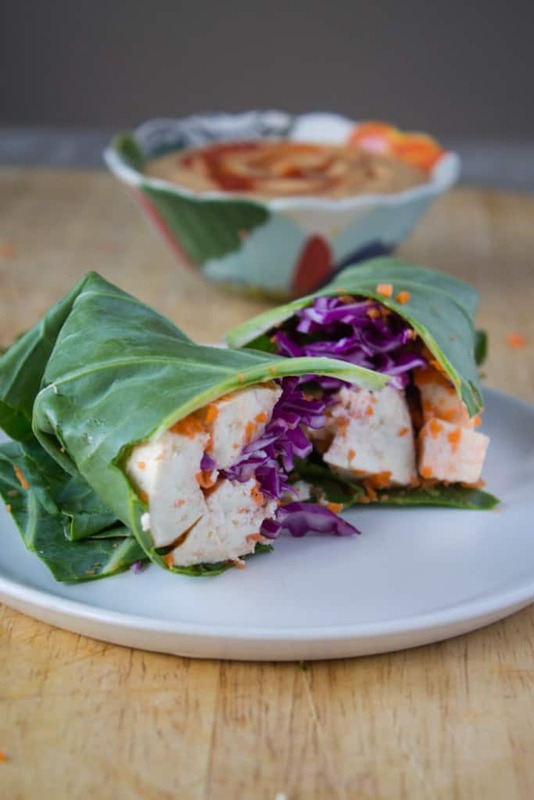 Fill wraps with tofu, carrots, cabbage and cilantro and roll up into a wrap**. Cut in half. Serve with peanut dipping sauce. *Use agave syrup as a vegan-friendly substitute for the honey. **Not sure how to roll these babies up? 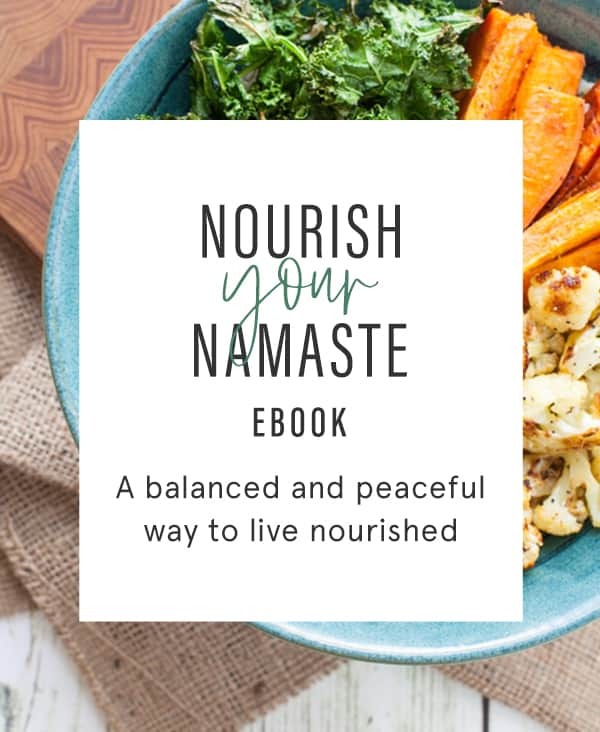 Check out this helpful tutorial by Carlene of Healthfully Ever After. I’d say this is a trend that’s worth the hype. They’re super easy to make, you can change up the filling so you don’t get bored with them, and you get an extra serving of veggies in! Wins all around. Tell me, have you tried this collard green wrap trend yet? Worth the hype? 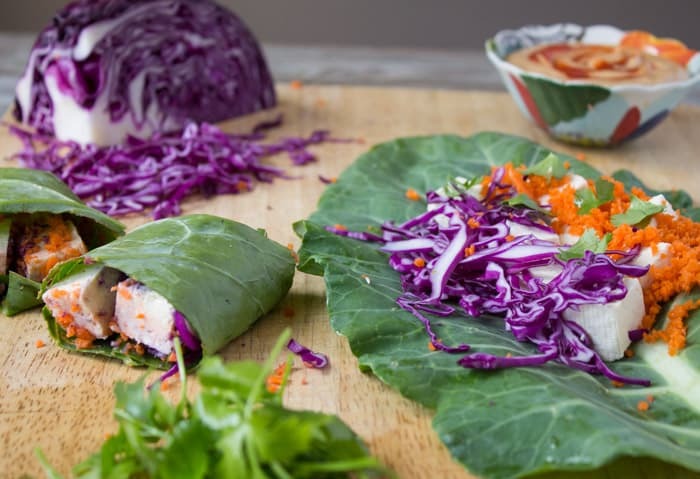 Love the idea of collard greens as wraps and the sauce looks delicious too! Delish! Now if only they’d start growing collards in my part of the world! I’ll have to sub rice papers (or maybe cabbage leaves?) in the mean time! Bummer, Katie! Cabbage leaves could definitely work! Hahaha straw to the peanut sauce is a fabulous idea!